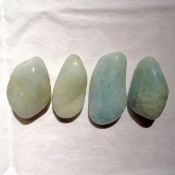 Aquamarine encourages spiritual growth, makes you dynamic, persistent and successful, gives clarity, happiness and allows your voice to be heard to be able to speak your truth. Aids hormonal balance, thryoid, supports immune system. You will receive one similar to the ones shown.